Venture is a Privateer-class light freighter designed to haul cargo or passengers. 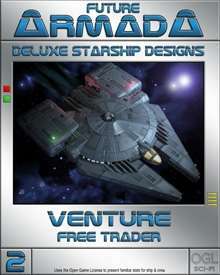 This class of vessel is easily modified and has proven very popular with independent traders (and smugglers) throughout known space. Like many independently-operated freighters, Venture has been modified to support a handful of offensive systems. The weapons are meant to dissuade pirates, but they can also serve to fend off over-zealous customs agents should the need arise. This progress-level six vessel is 140 ft. long and can be operated by a crew of two, though quarters are provided for six. The command section can detach from the main hull to serve as a launch or escape pod, and the cargo modules can be replaced by hangar bays or even passenger compartments. Versatility is the name of the game with the Venture. For those who value speed over storage space, the Volatus-class variant is provided. This has no side modules and adds a couple of additional engines instead. 18 page PDF file detailing the ship, interior locations, and personnel. Open Game License stats provided for the vessel, crew, and command pod (which can detach from the main hull). Full-color 20 page PDF file containing complete interior maps. Includes alternate configurations (cargo bays, flight decks, & passenger modules). Also includes miniature-scale maps for tactical combat. Composite map of the ship interior. A 24x30 inch, 150 dpi, color JPEG image for Venture. A 24x30 inch, 150 dpi, color JPEG image for the Volatus variant. "Bonus Art" directory with additional views of the ship and launch. Like the Morningstar, this second installment of Future Armada is meant to serve as a ready-made vessel for use by either players or game masters. It is also intended to be easily adapted to other progress levels and game systems. Capitalize on this opportunity and the Venture should prove to be a profitable addition to any campaign! This title was added to our catalog on January 28, 2005.